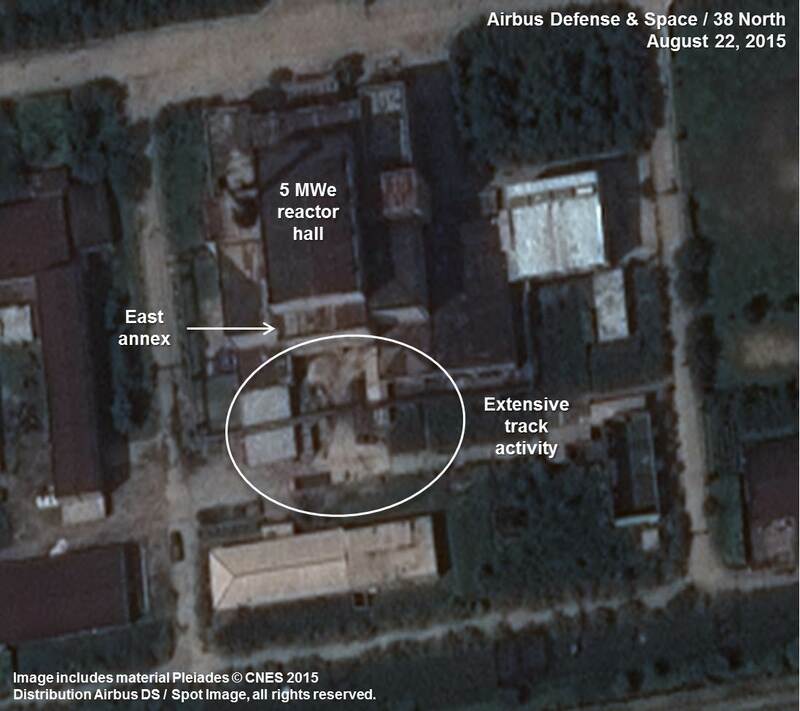 Imagery from August 22 indicates a high level of vehicle activity not previously observed in front of the 5 MWe reactor hall. Vehicle tracks extend into the ground level of the building beneath an overhanging four-story annex on the east end of the reactor hall out to a road where large trucks can easily maneuver. Also, a large truck is seen in position apparently awaiting a load. The level of track activity indicates that this is not the first truck to be loaded with material from the hall (figure 1). Figure 1. Vehicular activity at the 5 MWe Reactor. The same imagery shows significant vehicular activity at the Radiochemical Laboratory complex where plutonium is chemically separated from uranium and other radioactive materials as well as converted into metal form, the raw material for building nuclear weapons. Heavy vehicle tracks from the road enter the facility, circle a support building and then extend to the spent fuel receiving building at the southwest end of the 190-meter long reprocessing plant. While some tracks lead directly to the spent fuel receiving building—across the road from where the spent fuel enters the main reprocessing building—others circle the support building suggesting that there may be a line of trucks waiting to unload at different times. There are a number of vehicles and piles of unidentified material in this area that may be associated with this operation (figure 2). Figure 2. Heavy vehicular activity at the Radiochemical Laboratory complex. Given the limited information available it remains impossible to determine the exact reason for this activity. However, there are a number of possible explanations: 1) unidentified and unrelated major maintenance or renovation activities are underway at both facilities as part of an ongoing program to modernize and upgrade the Yongbyon facility; 2) the North Koreans may be replacing contaminated equipment from the 5 MWe Reactor and moving it to the reprocessing complex for storage or decontamination; or 3) significant vehicular traffic involving both the 5 MWe Reactor and the Radiochemical Laboratory complex—including the spent fuel receiving building—may indicate preparations for unloading spent fuel rods from the reactor for the purpose of producing new plutonium. If this explanation proves to be true, it would represent an important step towards the further development of North Korea’s nuclear weapons stockpile. 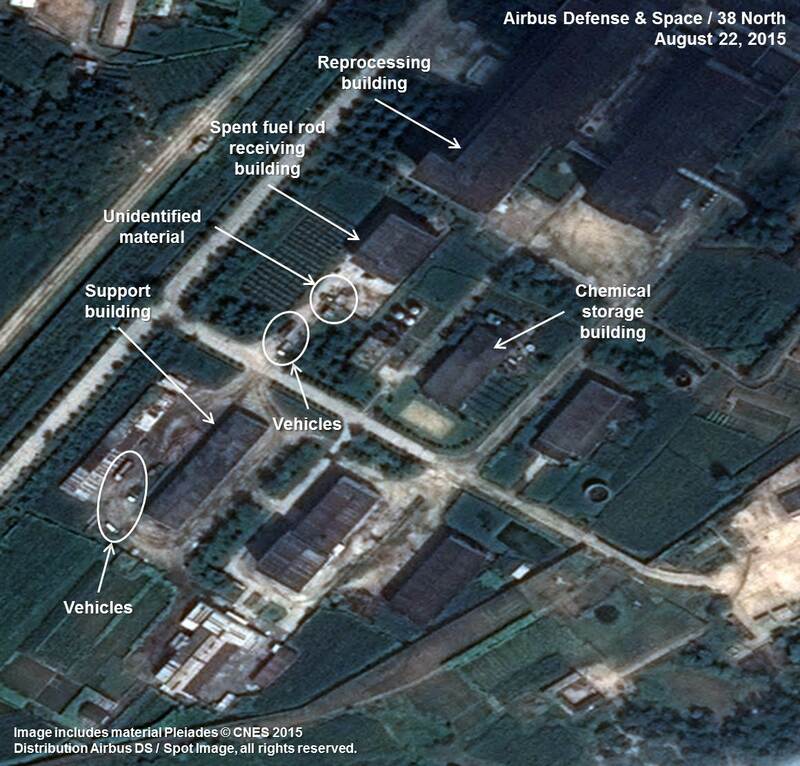 While international attention has recently been focused on North Korea’s Sohae Satellite Launching Station (“Tongchang-ri”) and the possibility of a fourth long-range rocket test in October on the 70th anniversary of the Workers’ Party of Korea, developments at Yongbyon are cause for concern and should be monitored closely by the international community to determine their purpose. Typically, a full core of spent fuel rods would be unloaded every 2-4 years from the 5 MWe Reactor, producing enough plutonium for up to two additional nuclear bombs. However, once again, determining the numbers of fuel rods involved in a possible operation is impossible using just the limited supply of commercial satellite imagery available.